I can’t tell a lie without giggling. My dreams of being a CIA operative were dashed when I learned I was too tall- too conspicuous. And, I’ve been told I’d be “no good” at infidelity. But I’ll tell you what. It was really easy to cheat on scratch baking this week. I’d been wanting to try pistachio cupcakes, but my last debacle with(out) self rising flour left me more gun-shy than normal for baking. 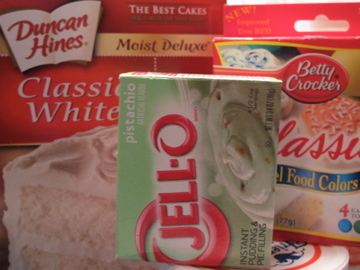 So when I found a recipe on Kirbie’s Cravings for cupcakes that involved boxed white cake mix and instant pistachio pudding, I felt pretty ok about it. The recipe also includes sour cream and vanilla, lest you think I’m too lazy, and it was so quick I was done mixing before the oven preheated. 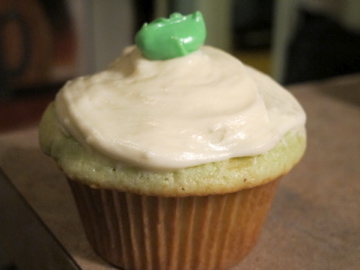 I made butter cream icing from scratch, and even used some food coloring to do a tiny bit of decoration. Yeah, I cheated. And it tasted good. This is great for St. Patrick’s Day. I am making Irish soda bread. Nothing says celebration like carbs!